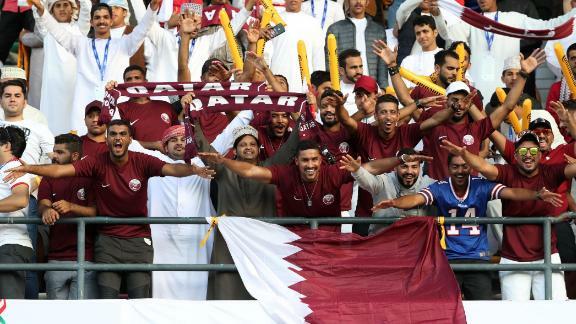 In a tournament that has been as much about the geopolitical struggle in the region as much as the football itself, Qatar secured the sweetest of triumphs courtesy of goals from the competition's top scorer Almoez Ali, Abdelaziz Hatim and Akram Hassan Afif. While Qatar's participation in the tournament was ostensibly about football, the talk throughout has often steered away from the sport and instead centered on the political and diplomatic strife in the region. Qatar's 4-0 win over the UAE in the semifinal was particularly difficult for the host nation to swallow, but this result is likely to prove even more embarrassing with celebrations likely to last all night in Doha. Yemen, Mauritius, Mauritania, the Maldives and Libya's eastern-based government also joined the boycott. Even when the Asian Football Confederation confirmed to CNN that the UAE football association had lodged a formal complaint with the Asian governing body over the eligibility of two of Qatar's players, a complaint that was dismissed, Qatar seemed unfazed.